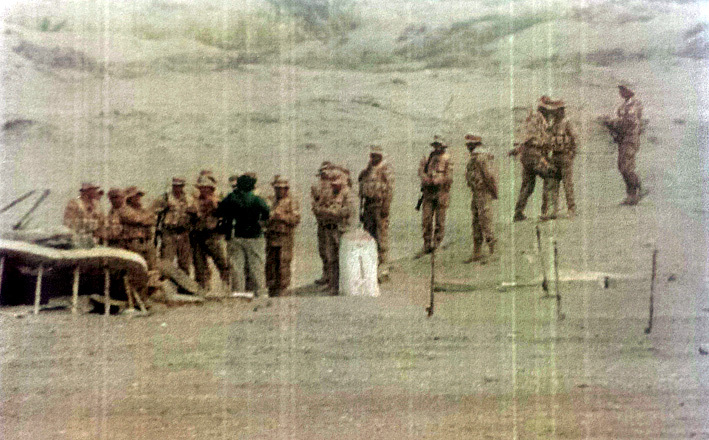 Un representativo del Ejército de Chile, fue una de las 20 patrullas extranjeras que participaron en el ejercicio “Cambrian Patrol 2015”, organizado por el Ejército Británico. En él se evalúan las habilidades de combate individuales y colectivas, además del liderazgo de sus comandantes. De acuerdo al porcentaje aprobado, se entrega una medalla. Durante el ejercicio las patrullas deben cumplir una misión de reconocimiento de largo alcance, en el cual cubren en promedio 50-60 kilómetros de distancia en menos de 48 horas, con un peso de 35 kilos de equipo por soldado, sobre un terreno y tiempo atmosférico adverso. La patrulla chilena, compuesta por integrantes de unidades de fuerzas especiales del Ejército, obtuvo medalla de plata, es decir, aprobó con rango de 64% y 75%, las 15 habilidades evaluadas. Cabe destacar que el 30% de las patrullas que participan en el ejercicio abandonan y no cumplen la misión. El ejercicio Cambrian Patrol tiene más de 50 años de historia, es organizado por la Brigada de Infantería Nº160 y es considerado el principal medio de evaluación para las patrullas del Ejército Británico –participan alrededor de 120– y representantes de las Fuerzas Armadas del Reino Unido. While it is true that the development of the T-35 Pillán has been extensively covered in the 25 years since the first prototype took to the air in March 1981, it is not less true that the first steps for this training aircraft -for which different configurations were tested- cause confusion when it comes to the specific identification of each of the prototypes and pre-production aircraft. In this article, the author takes a brief look at the history of the first incarnations of the renowned Pillán. The first Pillán prototype, model PA-28R-300, was designed and built by the Piper Aircraft Company's Advanced Engineering and Experimental Department, in Lakeland, Florida. It took to the air for the first time on March 6, 1981, piloted by Hugh Smith, the factory's test pilot. A series of tests were conducted on this prototype, among which there were controls, speed, spins, flutter, prolonged inverted flight, engine lubrication, fuel, brake hydraulics and so on. Not much time passed after the point when the Chielan Air Force or FACh, gave approval for the work being done, and ordered the production of a second prototype and three pre-production examples, for N300BT (c/n 28R-300-01) to be taken to Chile in January 1982. It retained the U.S. registration for the flights in country and also wore the XBT lettering (for eXperimental Basic Trainer). Its operational life in the country, regrettably, was short since it had an accident at the El Bosque Air Base, in Santiago, on 26 February 1982, shortly before the Feria Internacional del Aire -FIDA ' 82- causing the death of the pilot, Lt. Fernando Malbran. In consequence, it was withdrawn from use due to total destruction. The T-35's second prototype (c/n 28R-300-02) was built and tested in the U.S., where it flew for the first time on August 31, 1981, bearing the civilian registration N40898. Its first flight in Chile took place on September 13 of the same year, with Cpt. José Ili at the controls; three days later it was officially delivered to the Escuela de Aviación (Aviation School), although this particular aircraft was never used for flight instruction. This plane received the serial number 102, but it was later changed to YBT when the serial 102 was assigned to the Pillan's 4th prototype (the second example assembled in Chile). It was exhibited at FIDA '82, already with the serial 102 and for some time, operated with the unofficial registration CC-EFQ, and an airworthiness certificate for flight demonstrations. It was until January 23, 1986, that the Registro Nacional de Aeronaves (National Aircraft Registry) of the Dirección General de Aeronáutica Civil (General Civil Aeronautics Directorate) assigned the registration CC-PZA to this aircraft (c/n 100-81), and was listed as owned by ENAER on the Supreme Decree (reserved for aviation) N° 133 of February 20, 1985. However, on an ENAER resolution issued in August 1993, this aircraft was withdrawn from use, with a total of 764.6 flight hours, but its registration was not cancelled until May 3, 1999. In 1994, this plane was transferred to the Museo Nacional Aeronáutico y del Espacio (National Air and Space Museum), at the former Los Cerrillos aerodrome, in Santiago, where it is exhibited with the YBT lettering on the fuselage, even though its ID plate still states that its ”serial number" is CC-PZA and its model is T-35 YBT. The first pre-series aircraft was also the first example assembled in Chile. Its first flight had been scheduled for December 15, 1981, but it didn’t happen until January 30, 1982. Originally its c/n was 001-82, while its designation was ECH-51. This plane was assigned the serial FACh 101 and its remarkable for lacking the stamping on the vertical tail surfaces as well as on the wing control surfaces. It was also the first prototype to incorporate a Plexiglas section behind the cockpit. FACh 101 was exhibited during FIDA '82 and afterwards if flew bearing the unofficial civil registration CC-EFP before being sent to Farnborough '82, where it wore the number "56" on both sides of the nose, number that was kept upon returning to Chile. Wearing the same markings, it participated in the 1983 Le Bourget exhibit, where it shared ramp space with the Enterprise Space Shuttle and its Boeing 747 transporter. The aircraft was officially registered as CC-PZB (c/n 101-82) on January 23, 1986, at the Registro Nacional de Aeronaves. This aircraft was extensively modified during the fist semester of 1987 and was used as prototype for the ENAER project ECH-51M, also known as T-35S, a single-seat version with aerobatic capabilities. Its basic weight was decreased and its cockpit redesigned to accomodate only the pilot, but keeping the original engine of the two-seater, the Textron Lycoming IO-540K1K5, and the standard T-35's range. It had a paint scheme similar to the one worn until then by the Pitts S2A and S2S of the FACh's Escuadrilla de Alta Acrobacia Halcones (Falcons High Aerobatics Squadron), keeping the registration CC-PZB. It made its first test flight on March 4, 1988, and was exhibited during FIDA ’88. The project did not go beyond this prototype, since the purported acquisition by the Halcones did not take place -instead the Extra 300 were purchased. Its last airworthiness certificate lapsed on May 31, 1990, and was withdrawn from use by ENAER on October 7, 1994; the last flight took place on January 15, 1991, having by then accumulated a total of 1,192.6 flight hours; the registration was cancelled on May 3, 1999. After some time, the fuselage was slated for preservation atop a pedestal at the División de Sistemas y Equipos de ENAER (ENAER’s Systems and Equipment Division), in El Bosque, sporting a white paint scheme, with red and blue cheat lines (the same color scheme worn by the company's demonstration aircraft.) There, it was given a spurious registration CC-SCM, and its ID plate was removed. Then, on June 22, 2006, the aircraft was delivered to the Museo Nacional Aeronáutico y del Espacio de Chile, where it has been officially on exhibition since July 13 of that same year, wearing the colors and registration that it carried during FIDA '88. The second pre-series aircraft was the fourth Pillan assembled, and it was also the second T-35 assembled in Chile, which was assigned the c/n 102, and designated as ECH-51. The date for its first flight had been planned to be for January 30, 1982, but it got delayed. This aircraft was the only one to had its fuselage painted light green and white, and with this color scheme it was exhibited -carrying armament- at the FIDA'82 in El Bosque, with the interesting fact that besides the rockets and low-power bombs with which it was exhibited, it had a gun-sight installed on the front cockpit. During the first semester of that year, its color scheme changed to the traditional red and white, and during the first semester of 1984, 102 was sent to Piper in Vero Beach, Florida, with the purpose of conducting extensive modifications to the cockpit. There, it received the U.S. civil registration N43612; upon returning to Chile it was assigned serial FACh 104 (c/n 104) and later on, the unofficial civil registration CC-EFS, the latter being the one it wore during its exhibition at Farnborough '84, and that it kept during the second semester of 1985. Using the airframe of CC-EFS, ENAER built the prototype for the T-35TX (Turbine eXperimental) which later on received the name “Aucán.” Its first flight took place on February 12, 1986, and on February 26, it received the civil registration CC-PZC (c/n 104-82), with which the plane was exhibited at FIDA ’86. The Aucán basically consisted of a turboprop version of the Pillán, converted in the U.S. by the Soloy Company, employing an Allison 250-B17D turbine of 420 shp. It also had some other minor modifications. After a fruitless promotional campaign, this aircraft experienced a series of notable changes, foremost being the replacement of its traditional three-piece canopy for a single-piece one, without framing, providing the pilot with excellent visibility and giving the airplane a more stylized appearance. The official presentation of this aircraft in its new configuration, took place at FIDAE '90 where it wore a camouflage scheme comprised of the colors typically worn by the Hawker Hunters in service with the FACh, but kept the registration CC-PZC. This aircraft was finally withdrawn from ENAER's inventory on June 21, 1991, and was later disassembled and its parts used as spares for other aircraft. On March 15, 1993, the company requested from the DGAC the cancellation of its registration, which took effect the following April 2. The previous situation notwithstanding, the fuselage and wings were obtained by the Complejo Educacional La Reina (La Reina Educational Complex), an educational entity that provides training for aviation mechanics; then the plane was mounted on a pedestal at one of the school's yards, minus the cockpit and the propeller and its nose was “modified” to simulate a jet air intake. At that time it was painted with bright colors and also displayed the spurious registration CC-CER, which is nothing else but the school's initials. Here it’s important to note that ENAER, later on, built a pair of turboprop prototypes, the first being the one carrying the civil registration CC-PZG (c/n 186-88), which was an aircraft modified as an ECH-51DT in 1991, and that incorporated most of the experiences gained with the Aucán project. It had also a longer operational life to the point of having received the FACh serial 191. The other was the aircraft registered as CC-PZH (c/n 196), an ECH-51ST whose particular feature was its split canopy that gave the airplane a strange external appearance. This airplane was registered in March 1989, and the registration was cancelled in April 1993. The third pre-series aircraft was the fifth Pillán assembled and the third one assembled in Chile. Its serial was FACh 103, (c/n 103), and was designated ECH-51. The date for the first flight had been set for February 25, 1982, but it too, suffered some delays (in any case, the airplane was already flying before April of that year.) This airplane presented the particular aspect of its canopy, unique within the prototypes and pre-series aircraft because of the shape of its rear section, adjoining the base of the VHF antenna. It was assigned the unofficial CC-EFR registration. This plane suffered from a series of structural problems of which a deviated central axis was the most severe. Early in 1984 it was repainted on a scheme similar to the one used by the FACh's A-37Bs, but shortly after, it ceased flying. It was seen, still grounded, during the first semester of 1985 and its remains were noticed around 1987 / 1988 at the FACh's Escuela de Especialidades (The FACh’s Specialists School.) In the end, it was sold as junk. The fourth pre-series aircraft was known mistakenly as the "first series production aircraft.” It was the sixth T-35 assembled. Its roll-out took place on March 8, 1984, during an official ceremony at El Bosque, where it was shown as "the first Pillan made in Chile.” It was assigned the serial FACh 105, instead of the number 104 which had been assigned to the second pre-series aircraft (102/CC-EFS/N43612/CC-PZC.) Some publications identify this plane as c/n 84-001, which would match the information above (the first built in Chile, in 1984). Its official status notwithstanding, it was used only to carry several tests on "g" forces, and upon completion it came out seriously deformed; it had however the unofficial registration CC-EFT. Its remains were broken up, as it was unusable, during the second semester of 1985. The construction of the fifth pre-series aircraft was not completed and the fuselage was used as a mock-up. During the second semester of 1985, it was noted ready for final dis-assembly and the fuselage remains were observed at the Escuela de Aviación in January 1988. It had no c/n assigned. The sixth pre-series aircraft corresponded to the last prototype and was the eighth Pillan built. This aircraft (FACh 107) carried three model designations (A, B, and according to what nowadays its factory plate shows, C). Permanently painted white, it was exhibited at Farnborough with the spurious government registration CC-EFU, together with the number “51” painted on both side of its fuselage. After the registration CC-EFU was assigned on January 23, 1986, (ECH-51C, c/n 107/84), it kept for some time the number mentioned above and was thus exhibited at the Le Bourget 1987 fair, and at the fair’s conclusion, and with the purpose of participating in the commemoration of Piper Aircraft Corporation's 50th anniversary, it was flown to the U.S. following the North Atlantic route. Later on, the Sub-Direction of Engineering modified the aircraft to ECH-51B standards, which is the version it keeps to this date. This plane still flies for ENAER as a demonstrator, wearing a white and red color scheme, and has been exhibited on several FIDAE editions. It has undergone several modifications, amongst them the "Milenium" conversion, which was adopted by the aircraft operating with the FACh's Escuela de Aviación Capitán Ávalos (Cpt. Ávalos Aviation School.) In addition to this plane, ENAER also operates the T-35/ECH-51B6 (c/n 166) for demonstration purposes. After the delivery of the ECH-51 serial 107, ENAER began delivering the first batch of T-35s for the FACh, which had been requested through a contract dated on July 6, 1984, for 30 aircraft. It was thus that the production phase of the most successful aircraft built in Chile began. An aircraft whose production allowed the opening of the national borders not only for the construction of these aircraft, but also for ENAER's possibilities as an aeronautical maintenance company. Se trata de una toma realizada el pasado 4 de noviembre, la que muestra más de 10 uniformados provistos de armas largas y acompañados por sujeto vestido de civil. SANTIAGO.- Pese que este viernes el Gobierno peruano [b]negó la presencia de personal militar cerca de la frontera con Chile[/b], una fotografía tomada por Carabineros apostados cerca del Hito 1 desmiente dicha información. Se trata de una toma realizada el pasado 4 de noviembre en la zona y que muestra más de 10 uniformados, los que estaban provistos de armas largas y estaban acompañados por sujeto vestido de civil. En una diplomática emanada desde la Cancillería peruana a Chile y que fue publicada por el diario "El Comercio" se destaca "la importancia de las Normas de Comportamiento para los Puestos de Vigilancia y Patrulla de Control Fronterizo Perú-Chile, marco vigente en la materia desde 1994, cuyos procedimientos han de ser observados y cumplidos estrictamente". En el texto, Lima destaca "la utilidad de los mecanismos de confianza mutua entre los miembros de las Fuerzas Armadas del Perú y de Chile", asegurando que son "los canales idóneos que contribuyen en el fortalecimiento de la relación entre dos países vecinos". El incidente provocó la molestia de la cancillería nacional, que de inmediato envió [b]notas de protesta a Perú[/b] por lo ocurrido, junto con la advertencia de que "no seremos tímidos en resguardar nuestra soberanía" realizada por el ministro de Relaciones Exteriores, Heraldo Muñoz. En sentido, Muñoz llamó al Gobierno de Ollanta Humala a "evitar actos imprudentes e incidentes innecesarios en la zona fronteriza". También les pidió a "cumplir con los acuerdos de medidas de confianza mutua. En este caso no se cumplió con el debido aviso previo a la presencia del personal uniformado en el sector del Hito 1". En tanto, luego de la aparición de las imágenes, es el Gobierno se envió un comunicado en el que se precisa que el grupo de militares que se aproximó al Hito 1 estaba conformado por 18 personas, cuatro de las cuales estaban con armas largas. "Conforme a la normativa vigente, los desplazamientos de uniformados a una distancia menor a 100 metros del límite político internacional deben ser comunicados con la debida anticipación a la contraparte", reiteró el Ejecutivo. El texto del comunicado añade que "el Gobierno de Chile coincide con el del Perú en que es indispensable que nuestras instituciones armadas respeten rigurosamente los acuerdos bilaterales para evitar incidentes fronterizos innecesarios. Chile reitera su voluntad de avanzar con el Perú en una senda de cooperación e integración, en una perspectiva de futuro y respeto mutuo". Pero la compra será de gobierno a gobierno, sin representantes ni lobistas.Los participantes en esta licitación, cuyas ofertas deben estar entregadas el 10 de noviembre, son el Sikorsky UH-60 Blackhawk, AgustaWestland AW149; Airbus Helicopters con la familia Cougar, Rosoboronexport con el Mi-171 y el KAI Surion. Según lo declarado por el general Jorge Gebauer Bittner, comandante en Jefe de la IIIª Brigada Aérea, con asiento en Puerto Montt: Se prevé aumentar la dotación de material de vuelo, tenemos un helicóptero bastante grande (UH-60) y se espera recibir dos o tres más de este tipo de unidades para poder concurrir con una mejor logística a los lugares donde se nos requiera. En realidad el pedido total se estima que será de 6 a 8 ejemplares (Roberto Sandoval, corresponsal de Grupo Edefa en Chile). Con el despliegue de unidades en diferentes zonas de la Región de Aysén, se realizaron los ejercicios finales de la IV División de Ejército, enmarcados en las actividades de instrucción y entrenamiento programadas para el año 2015. Las maniobras se iniciaron con la planificación emanada desde el Cuartel General Divisionario, para luego continuar con el traslado de las unidades a los diferentes sectores y localidades de la Zona Jurisdiccional de la IV División de Ejército, donde se incluye el predio militar Las Bandurrias, ubicado a 22 km de Coyhaique, el sector del Glaciar Calluqueo y la Península de Levicán, distante a 160 km de Coyhaique. Esta instancia busca obtener el máximo de experiencias en un marco táctico, certificando en terreno la eficiencia de los sistemas de mando y control, telecomunicaciones y conducción de unidades, con el correspondiente apoyo administrativo y logístico al personal desplegado. En este contexto, el Comandante de la IV División de Ejército, General Rodrigo Díaz A., inspeccionó en terreno el desarrollo de todas las actividades contempladas, considerando inicialmente la planificación en los respectivos puestos de mando y unidades desplegadas en las zonas de acción. La dotación consiguió las primeras cinco mil horas en agosto de 2007, y las 10 mil, en septiembre del año 2010. Luego de más de una década operando en el marco de la Misión de Estabilización de las Naciones Unidas en Haití, el Grupo de Helicópteros de la Fuerza Aérea de Chile en ese país cumplió 16 mil horas de vuelo sin incidentes, de las cuales casi el 14 por ciento corresponde a vuelos nocturnos. En el marco de este nuevo hito, cabe destacar que las misiones más habituales que efectúa el Grupo de Helicópteros son el traslado de personal y carga a distintos helipuertos dentro de Haití, reconocimientos aéreos con componente policial y militar, y evacuaciones aeromédicas. Doce países participaron de este ejercicio que se desarrolló en dos fases, la primera llamada "Work Up" y la segunda "Scenario"
Brasil. Entre el 16 y el 23 de noviembre, la fragata “Almirante Riveros” participó en el ejercicio multinacional UNITAS Atlántico 2015, que se llevó a cabo frente a las costas de Brasil, en conjunto con las Armadas de Brasil, Camerún, Ecuador, Estados Unidos, Guatemala, Honduras, Perú, República Dominicana, Senegal, Inglaterra, México y Chile. El entrenamiento se desarrolló en dos fases, la primera, llamada “Work Up”, se desarrolló frente a las costas del estado de Rio Grande do Sul. En esta etapa las unidades participantes realizaron ejercicios de guerra antisubmarina, guerra antiaérea y de reabastecimiento en el mar. En tanto, durante los últimos tres días de entrenamiento se desarrolló la fase “Scenario”, en un área ubicada al sur de Rio de Janeiro, en la cual se dividieron las fuerzas objeto simular una situación de crisis entre dos países. En esta última etapa, los buques realizaron ejercicios de multiamenaza y de interdicción marítima. El 25 de noviembre tendrá lugar la ceremonia de clausura de este entrenamiento multinacional en Rio de Janeiro, luego de siete días de ejercicios en el mar y más de 1.800 millas náuticas navegadas, equivalentes a 3.300 kilómetros, para dar paso al ejercicio bilateral Bogatún, entre la Armada de nuestro país y de Brasil. 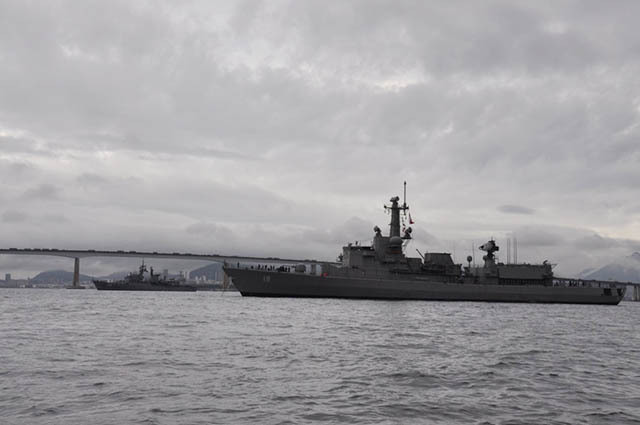 La fragata “Almirante Riveros” recaló el lunes 23 a la base naval de Mocanguê de la Marina de Brasil, y llegará a Punta Arenas el 3 de diciembre. El Coronel Felipe Cuéllar Loyola, instructor invitado en el Instituto para la Seguridad y Cooperación Hemisférica (WHINSEC), fue distinguido por las autoridades militares del Centro de Armas Combinadas (CAC) en Fuerte Leavenworth, Kansas y del Fuerte Benning, Georgia, como “Instructor Maestro”, “Mejor Educador del 4to Trimestre del año 2015” y “Mejor Educador del año 2015” del instituto. El oficial superior dictó más de 300 horas de clases en los Cursos de Comando y Estado Mayor, Operaciones Conjuntas y en la cátedra de Derechos Humanos; cumpliendo además de manera sobresaliente con los estándares de calidad docente que regulan la enseñanza militar en el Ejército de los EE.UU. de América. Las distinciones otorgadas al Coronel Cuéllar, fueron obtenidas tras competir con oficiales educadores norteamericanos e internacionales, consiguiendo la máxima calificación que se otorga para esta competencia. Esa calificación lo habilitó para participar en el nivel del Comando de Entrenamiento y Doctrina (TRADOC), junto con todos los ganadores de todas las Escuelas y Centros de Excelencia dependientes del citado Comando, para el puesto de mejor educador del Ejército de los EE.UU., resultados que se esperan conocer durante el primer trimestre del año 2016. El Comandante de WHINSEC, destacó que el logro obtenido por el Coronel Cuéllar, “junto con demostrar sus notables condiciones y habilidades docentes, refleja la sobresaliente aplicación del modelo de educación para adultos, que se aplica tanto en la Escuela de Comando y Estado Mayor en Fuerte Leavenworth, como aquí en WHINSEC”. Recalcó además la importancia que un profesor invitado compita en el nivel de todo el Ejército de los Estados Unidos, señalando que “es la primera vez en la historia del instituto, que un instructor internacional obtiene el premio de Mejor Educador del Año, y es un orgullo que nos pueda representar en el nivel de TRADOC”. En la ceremonia de premiación el Coronel Cuéllar recibió las medallas de Encomio y de Logro del Ejército de los Estados Unidos por los servicios que prestó al instituto, durante un año y medio de labor docente y por sus logros como educador. De igual forma, recibió la medalla de la “Honorable Orden de Santa Bárbara”, otorgada por la Asociación de Artillería del Ejército de los Estados Unidos, al constituir un ejemplo de profesionalismo y dedicación. La exitosa participación del oficial superior, como instructor invitado en WHINSEC, ha permitido mostrar la capacidad profesional de nuestro personal y con ello contribuir al sólido prestigio internacional del Ejército de Chile.